Tabitha Tuders is the younger sister of one of our employees. She was last seen at approximately 7 a.m. on April 29, 2003 at her home. 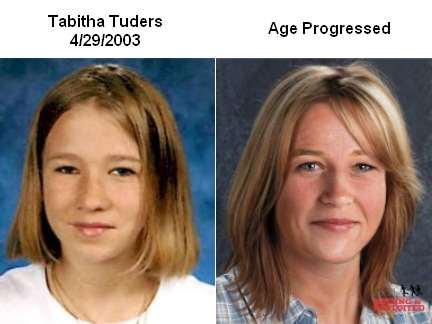 Tabitha's photo is shown age-progressed to 19 years. Tabitha has a birthmark on her stomach, a scar on her finger, and her ears are pierced.